Lorenzo Neal played college football at Fresno State University. He entered the 1993 NFL Draft and was selected in the 4th round as a running back by the New Orleans Saints. He got injured in his career, so he made the switch to fullback. He was the lead blocker for great running backs like Corey Dillon, Eddie George, and LaDainian Tomlinson. He made the Pro Bowl four times in his career, and was the lead blocker for 11 straight 1,000 yard running backs. Check out our interview. Download the AUDIO with Lorenzo Neal, click here. Announcement : Hello, my name is Max Strauss with http://prointerviews.org/, http://facebook.com/ProInterviews/, http://twitter.com/ProInterviews/. Please be a part of Pro Interviews. I’d like to welcome you to the interview with Lorenzo Neal and a special Q&A session with his son, Lorenzo Jr. Lorenzo was a fullback and linebacker at Fresno State University. He then entered the NFL Draft in 1993 and was drafted in the 4th round, 89th overall by the New Orleans Saints. Throughout his sixteen career, he played for the Saints, Jets, Buccaneers, Titans, Bengals, Chargers, Ravens, and Raiders. He paved the way for great running backs, and was on an eleven-year streak from 1997 to 2007 with his backfield commanding 1000 yard-plus rushers. He was the primary fullback for many teams and a fan favorite. He was defeated in his only Super Bowl appearance with the Titans. Let’s get started with the interview! First is a brief Q&A session with his son! About a minute later will be an interview with Lorenzo. I hope you enjoy the collage also! Strauss : What’s your son’s name? Neal : What’s your name, son? Neal Jr. : Lorenzo. L-O-R-E-N-Z-O. Strauss : What grade are you in? Neal Jr. I’m in seventh grade. Strauss : Do you play football? Neal Jr. : Yeah, I play football. Strauss : Are you a fullback like your dad? Neal Jr. : Well, I play linebacker. I did play fullback, but it’s not exactly my favorite position. Strauss : What’s father, Lorenzo Neal think of that? Neal Jr. : He wants me to play linebacker, and I do too. Strauss : Are you going to go high school and play football there? Strauss : Alright, sounds like a plan. Lorenzo, you there? Neal : Alright, here we go buddy, I’m back. Let’s get it going! Strauss : Why do you really use twitter? Sometimes if you have an individual with some foresight, and they start telling you things that you need to do, to help protect your brand and other things you do. You got to get involved. Sometimes as an adult, and as a parent. We think that the way of doing this, is the same way. But sometimes, we forget, because we’re all at work. Especially, if you look at newspapers, they’re becoming obsolete. If you look at coupons… Because now, with the touch of a button, internet and all the different things. You can deposit a check just by taking a picture with your phone. I mean, social networking and social media is the way of the future. And, I advise my generation that is still young and still vibrant. Things are evolving so much faster they are now especially with social networking. So, I definitely have to keep up with it. Strauss : If football didn’t work out for you, what was your plan? Neal : Well, I think that’s a great question. I went to Fresno State and I majored in criminal justice with a minor in public communications. I like talking to people. I really think God gave me the gift of gab. But, I really look at individuals coming from a small, little community, I think if it didn’t work, I definitely would have been working with juveniles or working with underprivileged children and I still do that now. But, I still believe that there are so many young kids and teenagers that are not bad kids, they just make bad decisions. I think that as an adult, we have to be able to connect with our youth because our youth is the way of our future. And, I think that I would really be involved in that, and still be involved in maybe coaching, but definitely would love to be around youth. It what keeps me young, vibrant, and it also makes me stronger. It makes me workout harder because I got to teach that these young boys especially like my son. Strauss : Speaking of children, who was your childhood star? Neal : Believe it or not, my childhood star, I always looked up to my parents. My parents are great people. I’ve been fortunate enough to adjust two parents who have always been able to meet somebody. As an athlete or entertainer, I look at Dan Fouts, believe it or not. I was a grown man playing a kids’ game. I was able to look up to my favorite team as a youth, the San Diego Chargers. It’s really interesting to see Dan Fouts, Chuck Muncie, and Charlie Joiner. All his receivers. Charlie Joiner and Wes Chandler, all those guys were my guys. They were the guys that when I was in the backyard and snapped, I was Danny Fouts when I backed up to throw the ball. Running the ball, I thought I was Chuck Muncie. When I’m catching the ball as a tight end, I was Kellen Winslow. These athletes, when I was growing up, realize it’s still the same as it is now. You dream as a young athlete through the LaDainian Tomlinson’s, through the Drew Brees, Matt Schaubs’. The different guys that every young athlete now, says in the backyard, “Man, I’m Adrian [Peterson].” I look at my son, he wears number 40. I said, “Why aren’t you wearing 41?” If you look at a lot of young kids, you see them wear certain numbers, why? You see a lot of 21 jerseys because of LaDainian Tomlinson. You saw number 22 jerseys back then because of Emmitt Smith. So, those guys the Dan Marinos’ , the Terry Bradshaws’, the Franco Harris’s, the Danny Fouts’, the Kellen Winslows’. Those were the guys I looked up to. Broadway Joe, Joe Montana. Those guys kept me dreaming. And, that’s why I advise the youth to keep dreaming. Keep dreaming and that’s why I kind of want to make sure I direct this conversation in the right way. Max, think about it, all these young kids, I told you who I admired, all the different athletes that I looked up to. Think about all the athletes now, the Vince Youngs’, all the different things that happen. Some young kid in the inner city, some young kid that plays quarterback in the community. Even though we feel that we don’t have to be role models, this is the reason why. These young kids look up to Vince Young, look up to Brett Favres’, the LaDainian Tomlinsons’, Phillip Rivers’, Peyton Mannings’, you look up to certain guys. The things that you do can reflect some of the outcomes of these young kids that dream. The way that you carry yourself on and off the field, can determine you as you. You, Max, as you. How you digress or even how you progress as a leader. Yeah, you’re in high school, but these are some of the athletes and some of the things that you are around that are going to help you become a better person. Also, you look at it and think, “Wow.” That’s why I challenge you, the student-athletes, the youth, and all of the people that are watching you. Even like the youth watching the professionals, there are young kids that are in pop warner, pee-wee watching that high school senior. It’s the young kids that still play pop-warner, and are like, “Watch my older brother! Look how he runs the ball.” It’s important how you leave your legacy, how do you be that leader, and that’s why I’m challenging you Max as a young man to get the message out there in the right way! And say, “Guess what, young youth! We’re role models too! Guess what, we’re leaders too.” Because there’s some kid that’s going to listen to your radio show, and see the things you’re doing on the internet and all the stuff you’re doing right now, and say, “Wow! How did you get to interview, hopefully, a future Hall of Famer?” or “How did you get to interview a sixteen to seventeen year veteran in the National Football League?” “How did you make this happen? Why?” Because it was a thought, it was a belief. Because you reached inside yourself and said, “I’m reaching out, I’m achieving greatness.” I commend you, young man, I commend you. Strauss : Wow, that’s a long answer, makes me feel good. More into your football career, what was your high school football experience like? Strauss : Did you play any other sports in high school? Neal : Yes. I wrestled as well, and did track and field. I was a state champion in wrestling. Speaking of wrestling, I had a scholarship in both sports, I could have gone to any school and wrestled. I mentioned I was California State Athlete of the Year, so in the whole state of California, I was the number one athlete. I was pretty good athlete, I worked hard, I wasn’t the best athlete. But I think what made me unique Max, just never quitting. You might be better than me. You might be stronger. You might be faster. But you’re not going to outwork me. Those are some of the things that I did. Football and wrestling. And, my strength was better conditioned through those sports. And I pay attention to detail. Because I advise young athletes, there’s going to come a time when everything is equal. Being that, the guy is just as strong as you, the guy is just as fast as you, and he’s just as tough as you. Then, it comes down to one thing, basic fundamentals, and heart, and desire. Those are the things that my father instilled in me. He said, “Hey! Keep working because you’re a Neal, no one can beat you, you’re a Neal!” Even though, that he knew when I looked at my father, he would say, “You’re a Neal! You made room. You came from me!” And he would look at me, and I knew at that moment, I couldn’t lose because I couldn’t let him lose. My father made me not lose, because I did not want to let him down. That’s why I always got up in the mornings, he would wake me up, “Rise and Shine!” before I go to school. And, when I came home from school, he kept pushing me. And, I told him one day, “Dad! You’re pushing me too hard! You’re pushing me too hard!” He took me, drove me up to the top of the mountain, walked me to the edge, and he pushed me, and I flew. That’s the analogy I like to use with the youth. Take them to the top of the mountain, and hopefully their parents will push them. Not literally, but figuratively speaking. Strauss : Your father had the most impact on your playing football, and your career? Neal : Without a doubt, he was definitely the guy who was going to push you to make yourself uncomfortable. He made me uncomfortable. I think that sometimes you have to reach out, and I want to thank you for doing that in this interview. Sometimes, you’re at boarding school, your not around your parents, your family, you might wonder why… because sometimes as humans, we get so bored of forests, we can’t see the trees. That’s like, why are you doing this, why am I here? Because they want, what’s best, and sometimes we don’t see it. And, someday, you’ll be like, “Hey man! I appreciate this! It’s helped me make my own way. It’s helped me make decisions!” Three things I try to push. Choices. Decisions. Consequences. And, it’s tough especially being such a youngster. Strauss : How hard was it to choose Fresno State for college? Neal : It wasn’t hard. It is a good school. You’re known in the community, you’re hometown about three miles south of that in Lemoore, California. And, it’s small, small, small. Instead of going somewhere and being a big fish in a big pond, why not go to a small school, and be a big fish in a small pond? And, become one of the most elite athletes there. I think that it gave me a chance to really fulfill a lot of my needs. Being that, I got to wrestle, I got to do football, I got to play linebacker. I got to play fullback. I got to do a lot of things that I think if I went to another school and was bred like a machine, I wouldn’t get to the things that you want. So, Fresno State was a great experience for me, great university, great institution, and met some great people along the way. It’s molded me to the person who I am now. Strauss : What’s your favorite memory from Fresno State? Neal : Some of my favorite memories are just being an all-american. Being able to be coached by a man named, Jeff Sweeney, a legacy and an icon in Fredville. Being coached by him, a great man, a great leader, also Dennis Delito my wrestling coach. I think those two men, whom I still stay in touch with today, still hang out with had a great influence on my life. Strauss : What was the most important thing you learned at Fresno State that helped you in the NFL? Neal : I think just determination. You’re wrestling. You’re going out there with another man, you can’t blame it on anybody. You can’t blame it on a linemen. It’s just you and another man. And, you’re wrestling. You can quit, you can give up, or you can win. And, I think what wrestling has done for me as a person, just the determination, how to be disciplined, is a sport that I think doesn’t get it’s just-dues. I think what I take most from the people that made up Fresno State, what happens if no body is there to teach? What is the college without people to teach? You have to find yourself and surround yourself with the right people. People sometimes are like, “Oh, I’m going to University of Notre Dame.” Yeah, there is rich tradition there, but the individuals that makeup Notre Dame. But you know what, you don’t own Notre Dame–the brand, the people do. And, that’s what it’s about it. I have been able to be blessed and fortunate to have good people around to me to help facilitate the needs and goals that I have in life. Strauss : Now moving on to your NFL career, what was your draft day experience like? Neal : Draft day was fun. You get drafted. You no longer go to Fresno State. You want to see where you’re going to get drafted. It was a great experience for me and my family. Strauss : Throughout your career, you switched throughout numerous teams. Was it harder to keep finding a new home? Neal : No, because you do your job. You have a job to do it. Sometimes, I think that’s what makes my career unique because I was able to experience a lot of different things at different places and different cultures. Strauss : So, you were nominated to the Pro Bowl numerous times, what was that like? Neal : It was great being nominated to the Pro Bowl. There’s only one. You know linebackers and quarterbacks, they bring three or four of their positions. But they only bring one, and you have to be the best at what you do. Strauss : What was one of the best experiences of your career? Neal : I think one of the greatest experiences was playing in the Super Bowl. Being in the super bowl is what every young kid dreams of. It was a great experience. The outcome wasn’t, losing to the Rams, but that was a great experience. Strauss : Did you have a best friend throughout your entire NFL career? Neal : You don’t always have great friends throughout your career. But, I had LaDainian, Eddie George, Blaine Bishop. Thank you. I still talk to Eddie, LaDainian, Ray Lewis, Drew Brees. I can think of all these guys I have a relationship with. You know regardless of if I have played football or not, these guys are just great men. They are just good people. Strauss : 1997 through 2007, you were recognized as the best lead blocker in the NFL, you paved the way for eleven straight running backs with over 1,000 yards, how did you remain consistent within different environments? Neal : Pride. Everything you do is your name. It’s got to be reflected by it. I just try to be consistent and try to do my job. Regardless of who’s behind, it’s about doing my job. I pretty much blocking for some great backs, LaDainian, Corey Dillon, Eddie George, Adrian Murrell, [Mike] Alstott, Warrick Dunn. It makes my job a little easier. Strauss : If you look back on your career, and you had to choose one play to define your career, what would it be? Neal : You know what. I don’t know if one play would define a career. I think that, there’s on one play that would define anyone’s career as far as my experience. I am a believer that you try to show that greatness is earned, and it’s about your destiny and longevity. That’s how you prove you’re great by doing something with consistency. When they say, “Hey! He had a great year, that was a great throw.” Okay, but does that define greatness? Greatness is doing something over and over and over again. I think I would be missed if I were to say it was one play that defines me as a football player. I think it was the longevity and the consistency that made me great. Strauss : You were also nominated to the NFL 2000s All Decade Team, what was that like? Neal : It was an honor being nominated. A decade is ten years and to be on the all-decade team, be the one of that decade… I’m humbled. I feel blessed. It’s an honor to be on that all-decade team. I’m grateful and thankful. Strauss : Do you have a nickname? Neal : Lo. Some of my teammates called me, Ram man. Lo-Daddy. All kinds. I sort of like Ram man. All I do is I lead with my head, like a little cartoon character. Lo, Lo-Daddy, Ram man. Strauss : Do you have a favorite quote or something that has helped you get through your career? Neal : My favorite saying… There’s a bunch of them. There’s so many of them. I’m a strong believe in, “Working will, 516a84 won’t.” “If you work, it will happen, wishing won’t.” So, many people say, “I wish I had a million bucks, I wish I could do this.” Well, that’s just a wish. But if you work, working will happen, wishing won’t. And, as long as you remember, “If you shoot for the sun, if you miss, you might land on the moon.” So, set your standards high. Strauss : What’s the best advice you’ve ever received? Neal : The best advice I ever received was from my grandmother. She told me she worked in the field, she was a great lady. She was 96 years old when she died. She worked in the field. When I graduated, she said, “Want me to tell you the only advice I could? Never set limitations when adults are around.” I said, “Why not, Grandma?” “They’ll realize how much they don’t need you.” She is one of those hard workers. She was with my uncle on Wednesday, back to work on Friday. That’s what life’s about. Strauss : If you could describe yourself as any ice cream flavor, what would he be and why? Neal Jr. : That’s a hard one, I don’t know. Strauss : What would you describe your dad as? Neal Jr. : I think he would be more of a vanilla since everybody knows him. Neal : That was a profound answer for him to come up with, how he said vanilla. I would describe myself as a Neapolitan because it’s chocolate, vanilla, and strawberry. I believe that you have to have vanilla, you have to adapt. You have to be able to adapt to your environment. You can’t be everything, but if you can be that Neapolitan, it’s hard not to like strawberry and it’s really hard not to like chocolate, and it’s really hard not to like chocolate. It’s hard not to like vanilla. I want to be loved by everyone, and that’s me. Consistency. That’s what I describe myself as. And, I love my son’s answer, Vanilla. Strauss : For someone that wants to play in the NFL, what’s the best advice you can give them? Neal : I think the best advice to play in the National Football League is what are you willing to sacrifice. Make yourself uncomfortable. You got to work. Strauss : Is there anything you want to tell fans we haven’t talked about? Neal : No, it’s good. Just put this in words. And, let’s definitely stay in touch. Hopefully we’ll do other things together down the road, buddy. Strauss : Thank you so much for your time Lorenzo Neal, I greatly appreciate it. The readers and listeners will greatly appreciate it! Neal : No worries, you be blessed. 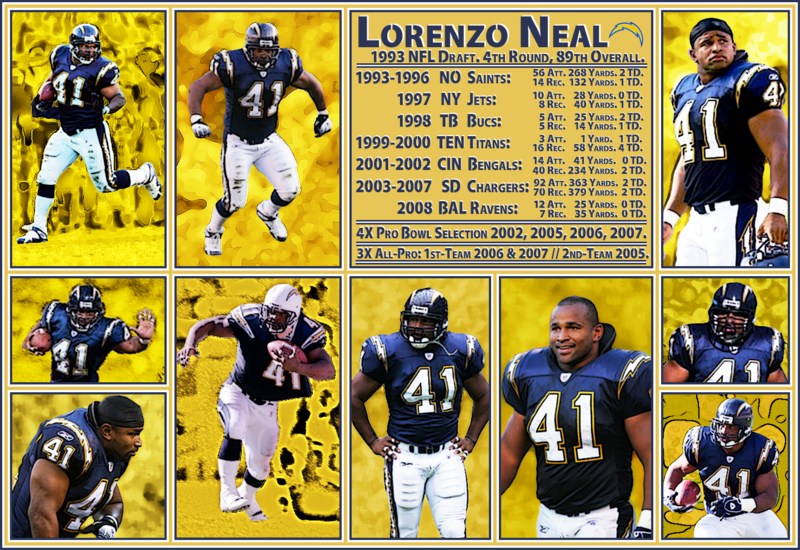 Announcement : Thank you for listening to the interview with NFL star and future Hall of Famer, Lorenzo Neal. I hope you enjoyed it. I hope you leave your comments below as well! Please check out my website https://prointerviews.org/ for other interviews, “LIKE” the Facebook page at http://facebook.com/ProInterviews/, and follow me on twitter at http://twitter.com/ProInterviews/. Please subscribe and add me on YouTube at http://youtube.com/ProInterviews/ Thanks again for listening! Stay tuned for more, and feel free to contact me! Great job man! I love reading these!